Spring is here, then it's not. Rain, fog; some summer weather with long bike rides. So cold you see your breath. May in Chicago. But it makes for productive time in the studio... 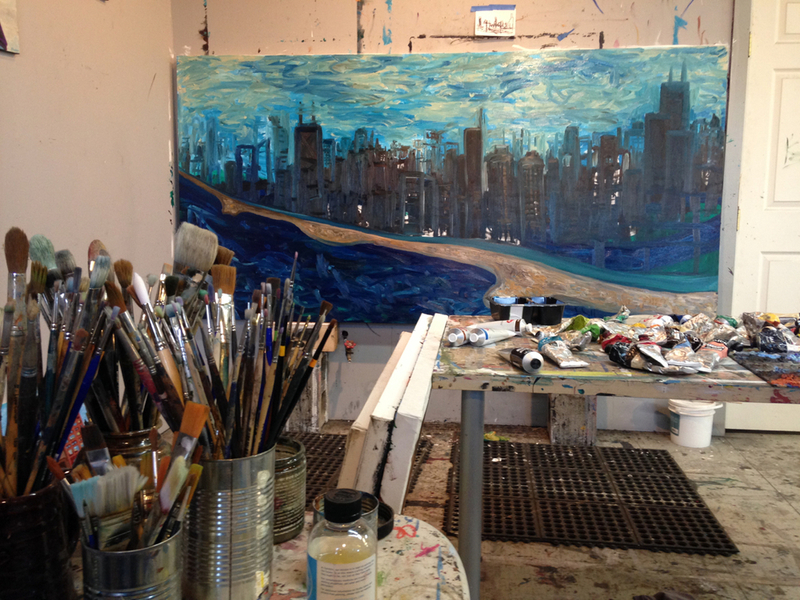 It's nice to now (occasionally) have the windows open in the studio while painting. I'm gearing up for my solo gallery show opening July 24 at Firecat Projects in Bucktown. I'm currently working on about a half dozen cityscape paintings and always taking photos and making sketches to use for inspiration. I'll be showing these new pieces along with some other older works. Oh, and there's the Cornelia Arts Building Spring Open Studios happening on Friday, May 29, 6-10pm. So needless to say, I've been slacking off in the blogging department. I missed posting in April (the first time in 7 years I didn't make a monthly post). This is a view of the studio in late January. No shows approaching -- so lots of things going at once and the studio is in general disarray. Things are blending together. Some abstract stuff and more controlled straight-forward brush stokes. Both styles are informing each other. I'm also working on expanding some of my color palette. Mostly though, just trying out new things and keeping it loose. And getting close to finishing this piece which is based on a photo from New York. Working in a more limited, muted palette. I'm working on about 6 or 7 paintings right now - three of them are focused on rooftop watertanks. One is based on the Swedish watertank in Andersonville that was removed last spring, one is from the West Loop/Fulton Market, and one from my imagination - no specific location. They are disappearing elements in our city skylines, so I enjoy documenting them while they're here. All of these are large scale pieces, oil on panel.